← Hong Kong, it’s different every time. This weekend I went on a home furnishings buying binge in an attempt to make my place look a little more like someone actually has been living there for the past 6 months. My father has been super helpful in helping me pick out, transport and assemble many of my pieces. To repay him, I asked him what he would like for dinner since he was going to be over helping me with a lot of tasks around the house. He said he wanted Cornish Hen. A quick google of cornish hen brought me to this recipe by Ina Garten for Cornish Hen with Corn Bread Stuffing. Since there were three of us for dinner, I decided to make four. I doubled her corn bread stuffing recipe. 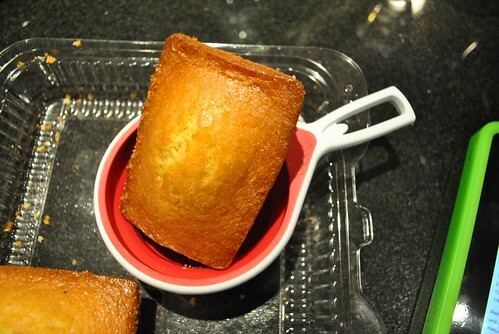 I used cornbread loaves from Stew Leonards. Each loaf is just a hair over one cup. The stuffing was simple to make and everything came together really easily. I omitted the parsley because I forgot to pick some up while I was food shopping. My bad, but I don’t think anyone missed it. I didn’t have any twine to tie the legs together, so I simple used my scissors and snipped a small slit in each side of the skin in the back. Then I just tucked each leg through the slit. It was a little tough for the first one since it took a lot of snips to get through the many layers of skin, but, by the fourth one, I was a pro. 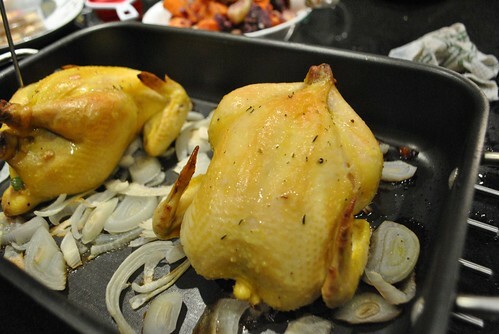 Hens lathered in canola oil with salt, pepper and dried thyme were plopped on sliced onions, then into the oven they went. I only had so many onions, and ended up using two roasting pans, so it was a bit sparse. Make sure you get a good layer of veggies on the bottom. I don’t think it has to be just onions, but maybe some onions, carrots and artichoke hearts (frozen) would be nice. As long as they were quick roasters. If you wanted to use potatoes, just make sure they are cut small enough, otherwise, you’ll have done hens, and not done potatoes! According to Ina Garten’s recipe, it should take about a half hour to cook. Mine did not. After a half an hour, I checked, and the juices were running clear, but the temperature at the thigh was only clocking in around 140. I believe poultry needed to be around 160 before it was done. So I popped it back in for another 10 minutes. 10 minutes later, temperature was hovering around 160, but at the puncture point from the thermometer, the juices were now running red, and not clear. Back in the oven it went. After doing a round of dishes (about 10 minutes later), I checked again. Now it was registering above 165. Done right? I let it rest for a few minutes (we were hungry and getting impatient), and it seemed that all juices were running clear. Upon eating it was discovered that it might not have been done as much as I would have liked. Still edible (or at least I’ll find out in a few hours), but it wouldn’t have hurt to keep it in another 10 minutes or so, which would put total roasting time at about an hour. 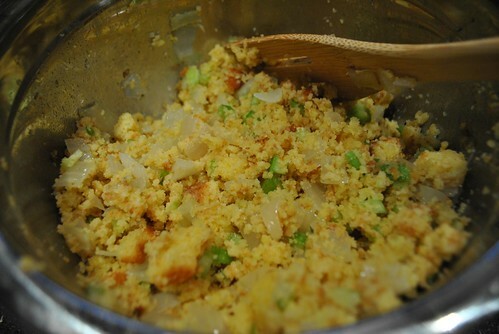 The cornbread stuffing was delicious and a great base to serve the hen on. The onions caramelized nicely and were a nice addition to the hens. I also had a couple of sides I threw together: Broccoli Rabe with garlic and golden raisins and a red potato, purple potato, carrot mix. Overall, it was a good dinner. I don’t know if I’d make Cornish hens for more than one person again. If there are two or more people to serve, why not just make one chicken instead? It would be much more cost effective. 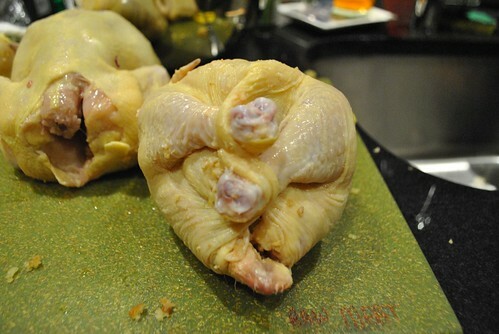 As a single gal, it would probably be nice to make one hen instead of one chicken. I saved the carcasses from the hens and threw them in the freezer for stock. Tis the season for poultry, so I’m saving all the bones to make some stock at the end of all these big dinners. Less waste!